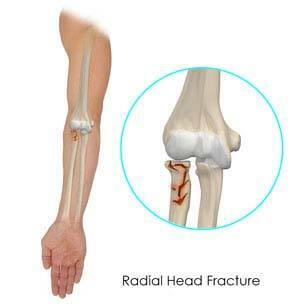 What are Radial Head Fractures? Type 2 fractures are characterized by displacement of bones and breaking of bones in large pieces and can be treated by surgery. During surgery, your doctor will correct the sof t-tissue injuries and insert screws and plates to hold the displaced bone together firmly. Small pieces of bone may be removed if it prevents normal movement of the elbow.